Welcome to the weekly, "Cooking with Chef Gus." I help cats cook up delicious and easy meals! 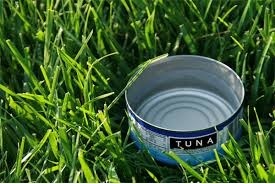 This week's entree - fresh tuna with some leafy garden grass. Summer iz coming, and we need to get our glorious awesome bodies in tip top shape for killing and being awesome. I know a couple of us haz eaten a little too many treats and cookies over the holidays and winter, but this meal iz a nice tastey start to getting back into a fine feline. 1 can of tuna - find this somewhere in the human's house. It iz usually in some kind of closet or cupboard. Every human house should haz this gift from the cat gods, and if they don't, you need to shred everything in your path until they provide you with it. If you iz in a time crunch, you can raid each neighbor's house until you find this delicacy. 3 pawz of grass - we all like a good grass munch now and then, and the health benefits are actually pretty good. Grass iz found in almost every backyard, and for those who do not haz access to grass, find a leafy plant and murder it gloriously. This meal iz quick and easy! After you haz gathered the grass, or the murdered plant, place it nicely on a plate. See? Almost done. Now, go grab the tuna can and the hammer. Place the tuna can on something sturdy, like human's glass dining room table. Now grab the hammer and summon the power of Thor.... and swing like a completely wild psycopath. The more damage you do, the better. The tuna can sense your power from within the can, and therefore the fear makes it more tastey. Az your smashing your human's house, be sure to actually smash the tuna can with a couple of glorious strikes. Smash it until the can haz exploded and exposed the fresh tuna. Let the smell tickle your nose. It iz ok to sneak a few bites before the meal... we all do it. Now, go to your plate of grass, and place the tuna on top of it. And ta-da! Tuna salad. Oh, I seemed to haz forgotten the dressing. Ok - go quickly murder something and pour the blood on top. Ahhhhhh... that iz pretty delicious. Grass usually makes me vomit... so be sure to do it on your human's pillow az a gift.